The products for sale in Original Murano Glass s.n.c. store are entirely handmade according to the ancient techniques of the glassmakers of Murano Venice and are selected by our experienced staff from the best artists, artisans and producers for their artistic qualities and uniqueness. 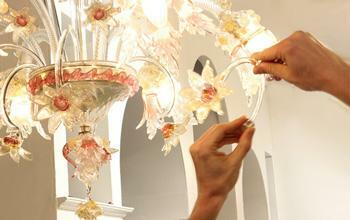 Our artworks are strictly handmade in original Murano glass in the island of Murano and in the province of Venice. Original Murano Glass s.n.c. is a company based in Murano, and it is proud to deliver worldwide pieces of artglass certified ORIGINAL MURANO GLASS OMG®, as the best made in Italy. 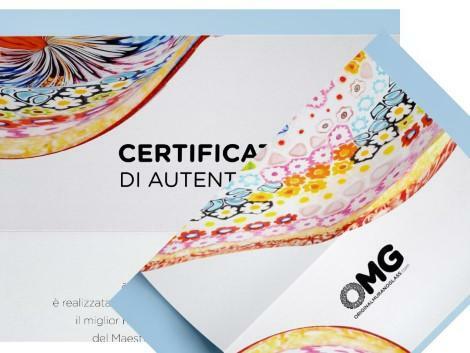 We ship all our products with their certificate of authenticity (a paper certified document) and our hologram brand sticker; both guarantee that the artworks are unique ORIGINAL MURANO GLASS OMG® pieces. Using the QR code, the customer will create the Electronic Certificate that will be saved in our database. Through this online certificate, customers can always validate the purchase made in our shop; this gives a guarantee document, valid over time, that certifies the value of our products, read here more about our Electronic Certificate. Our staff is always available to confirm and validate the purchase made in our shop; this is to give to our customers a guarantee document, valid over time, that the products are valuable piece of art, possibly documented with photos, videos and descriptions of the work collected every day during our work. Our certificate is valid as proof of purchase in our shop, and certify the originality and quality of the product. In this regard, we advise our clients to maintain our certificate, and possibly the order invoice that is sent via email upon purchase and stored in our archives that can always be verifiable. Many of our artworks have also the trademark Vetro Artistico ® Murano, when it is made from a producers joining the Consorzio Promovetro. To know more about it, click here. Our collection in original Murano glass is a vast and heterogeneous proposal certified that includes beautiful glass artworks of famous and emerging artists from the island of Murano, also it includes many artworks of famous companies of Venice, unique and antique pieces made over the last 50 years by famous Venetian glass masters, after having been thoroughly evaluated by our experts and re-proposed for sale with our certificate.